Europe is home to some of the most magnificent ancient structures of the world. One of them can be found near Avebury, England. The structure is known as Silbury Hill and it is a stunning site to view in person. 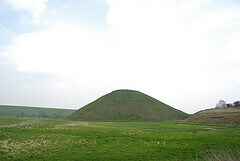 The largest man-made mound in Europe, mysterious Silbury Hill compares in height and volume to the roughly contemporary Egyptian pyramids. Probably completed in around 2400 BC, it apparently contains no burial. Though clearly important in itself, its purpose and significance remain unknown. Archeologists estimate that the hill was built 4,700 years ago. The hill's remarkable design would have required hundreds of workers and vast amounts of dirt. The hill is 131 feet tall and is situated close to other neolithic monuments, such as Stonehenge, Avebury Ring and Marden Henge. It is part of the Avebury World Heritage Site. All of the mysterious structures are frequented by thousands of tourist each year. The hill is located in the Wiltshire countryside. Visitors are permitted during daylight hours, however there is no access to the hill itself. Since the tickets are free, choosing a particular time to visit will not be relevant. The best time to go is when the sun is shining and the weather is warm. Silbury Hill is a UNESCO World Heritage Site and is visited by many tourists for good reason. The hill remains a mystery and continues to mesmerize locals and tourist. Last updated by Sean Crawford on 17 June, 2012 in Destinations.